A heavy dense fog that feels almost like it’s raining. Kind of refreshing after the achingly toasty past few days. But this is the day that all of the people in the harbor are heading home to their jobs and the start of school. I wish for them safe passage and to not do anything dumb during the mass exodus from the harbor. Meanwhile, those of us who are staying are breathing a sigh of relief. It’s been an intense summer – business as usual, I hear. Time to fix up the boat to get through what we hope will be a rainy winter. Get us out of drought conditions. Yesterday was a delightful new tradition, a Dogathon to celebrate the vet on the island. We had a parade of dogs down the forbidden Front Street followed by a party on the ballfield all afternoon. 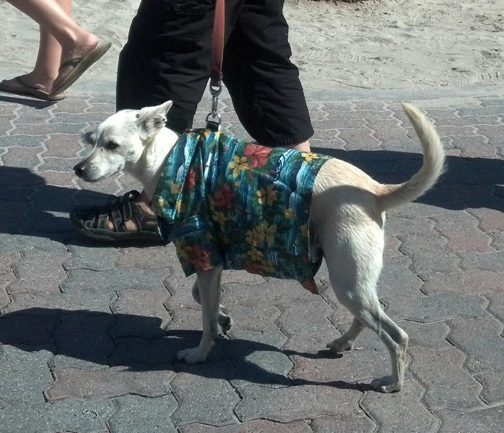 Austin placed in the dog show for waggiest tail and best costume ( Hawaii Shirt). It was a great All Day Doggie Date for us. This entry was posted on Monday, September 2nd, 2013 at 3:20 pm and is filed under Uncategorized. You can feed this entry. You can leave a response, or trackback from your own site. Haven’t seen anything new from you in awhile – hope everything’s all right!